Greetings from Anywhere: Wish You Were Here invites people in Stuttgart to write postcards – but not from Stuttgart. 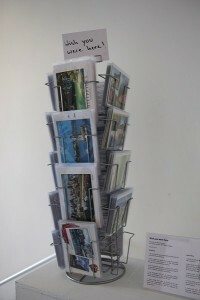 A selection of postcards from popular holiday destinations is available on a postcard stand. Visitors can choose a postcard, write a message to a recipient of their choice, and address the postcard accordingly. These cards are then placed in an envelope and sent to a collaborating agent in the corresponding country. The agent removes the postcard from the envelope, adds a stamp, and brings it to the local post office, ensuring that the card finally arrives at the intended address, as a holiday greeting from a place the sender never visited. Wish You Were Here is an exercise in the art of not being there. It offers the imagination of an ideal holiday instead of the futility of the tourist’s attempt to escape: instant memories for everybody! Wish You Were Here was developed as part of Arttours Stuttgart.